This lovely way with kale is so childishly simple that I am reluctantly sharing it – it is hardly a recipe and I feel like a bit of a cheat but I have to include it in this blog for the simple reason that it is one of the vegetable dishes I cook most often and eat with most pleasure! 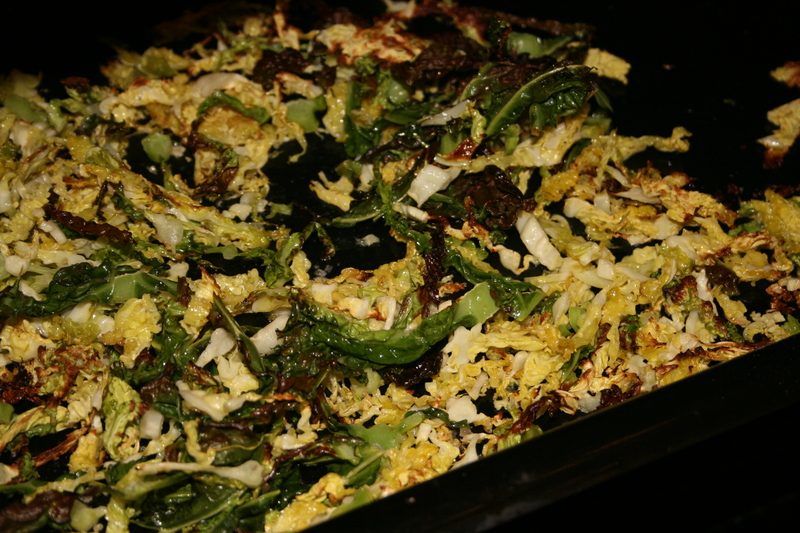 Ingredients and method : One shredded cabbage or kale or any dark green leafy cabbagey thing! Spread into a roasting dish, add a sprinkle of sea salt, a line of olive oil and roast under the grill for 10 min or until the tips turn brown. Shake it and then grill some more, making sure not to burn it! It’s quick! Enjoy as a side dish with any roasted meat. Quinces are the star fruit of winter and make it up in taste subtlety and exotic look for the lack of variety available at this time of year. So enjoy them while you can! Preheat the oven to 230˚. Rub the duck legs with some of the olive oil, season with salt and pepper then place on a rack. Roast in the oven for about 30 min until the skin is crisp and raised in places. Pour a pint of water and the juice of one lemon into a pan. Bring to a boil, add the quince quarters and simmer until tender. I left the skin on mine because their skin was thin and lovely but some variety have a thick skin that needs peeling. Slice the quinces quarters and fry them in olive oil and butter until golden. Reserve. Take the duck out of the oven and dip some of the fat out into the quinces pan – a couple of spoonfuls. Stir in the grated ginger, honey and cinnamon and fry gently on low heat. Add some more lemon juice. Pour some water to make this into a sauce and let it bubble a few seconds. Arrange the legs and quinces into a dish and pour the sauce over it. Sprinkle a bit of coriander to serve. 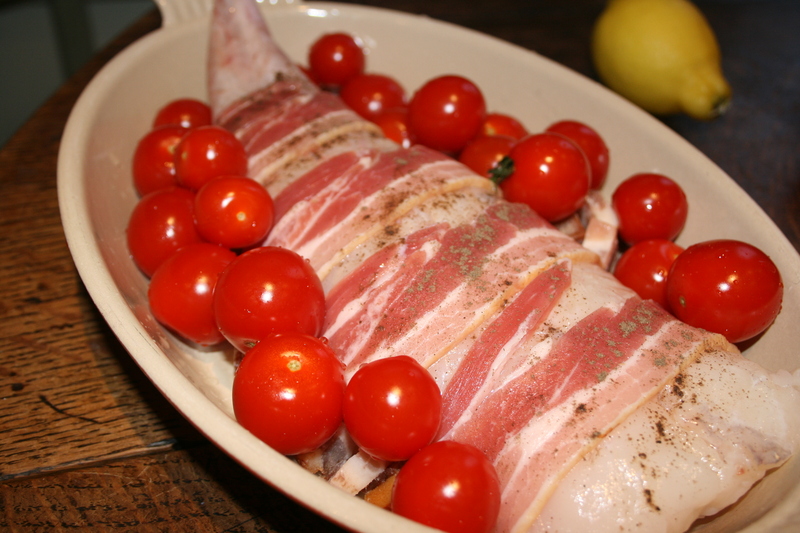 This dish would make a tasty alternative to the traditional Christmas turkey, I reckon. 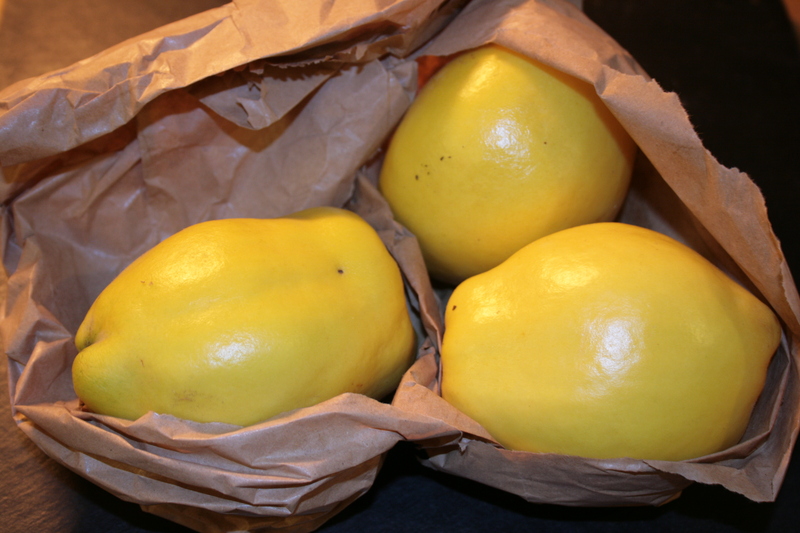 I particularly love the way the quince slices melt in the mouth – one of the nicest ways to serve quinces, at any rate. Original recipe by Ghillie Basan, a brilliant travel and cookery writer – and friend- who lives in the wilderness of Scotland but whose cooking is infused with middle eastern spices. Her books are a true inspiration for anyone who enjoys Mediterranean flavours and heritage. Now forgive me: I do not usually want to do restaurant food at home; there are places for that! The day before: put your lamb in large chunks into a large cooking pan. Pour the wine and soak the herbs in it. Cover tightly and put in a warm oven (140℃)for 7 hours. You don’t necessarily need to hang around but be there in the last hour at least to check! Take your meat out of the oven and with a spoon and fork, carefully push all the flesh off the bones. Try and remove any large bits of fat that remain, if any. This dish should be moist but lean. Strain the sauce into a saucepan and press the flesh inside a tureen or a cake pan for the night. Cover with foil, put some kind of weight on it if you can and reserve in the fridge. Serve out of the pan and cut in thick slices like a loaf, with the warm sauce on the side. I served it with warm lentils but any winter vegetable will do. 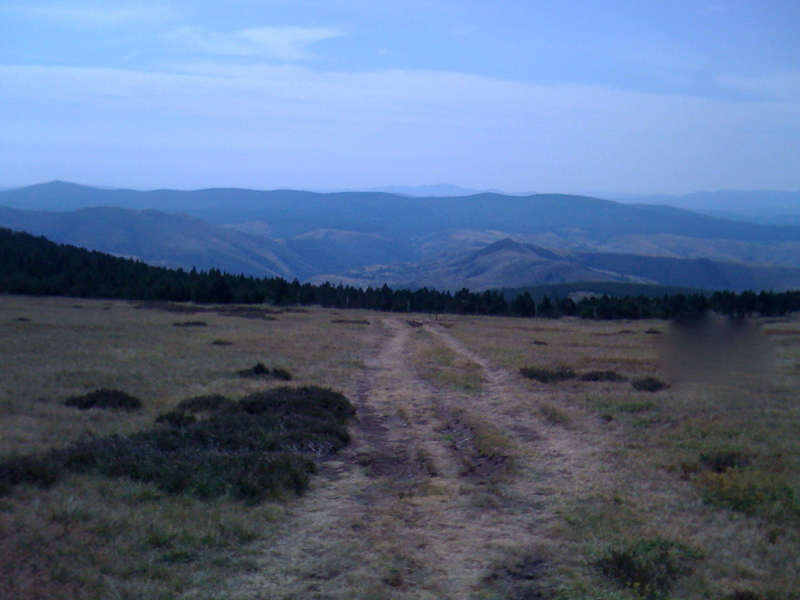 I was travelling in the Cévennes last August, in the south of France and we stayed at a charming hotel called « La Lozette », about half hour from Florac. I had selected it because it enjoyed a great location for walking the hills and swimming in the river but also because it is graced with one of the best tables in the area: This recipe was kindly given to me by the chef, Mr Borgès. 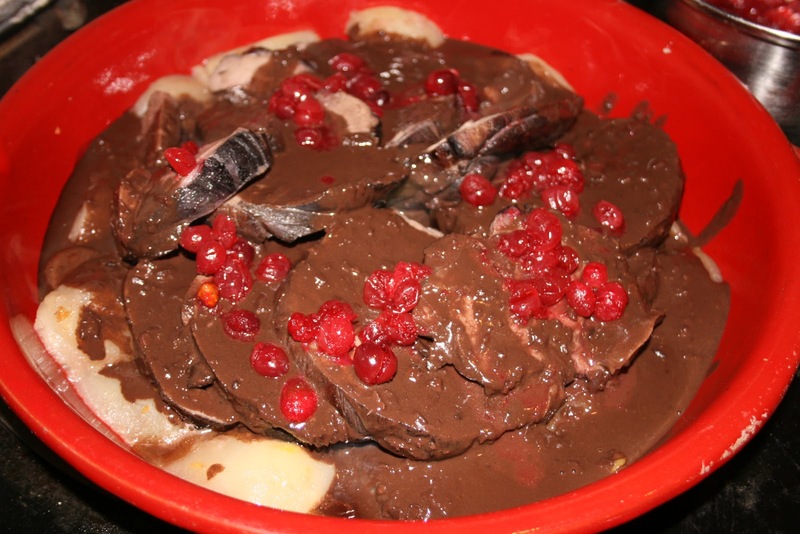 It is one of the best lamb recipes I’ve ever tasted ! Recipe from Mr Borgès at La Lozerette, Cocurès. With much thanks.